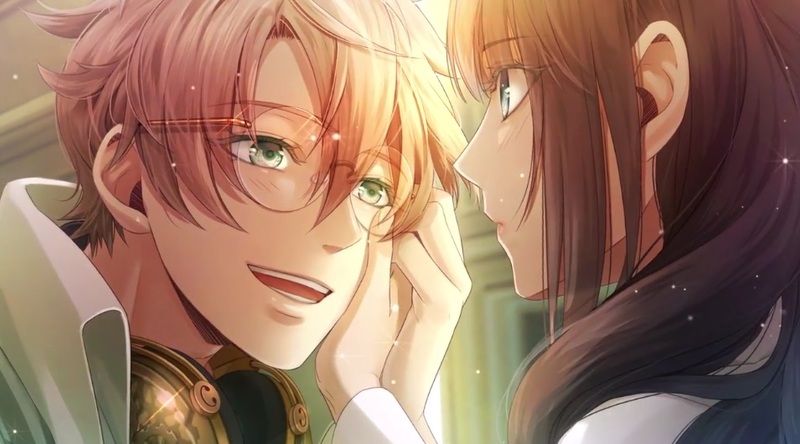 Just in time for Valentine’s Day, Aksys Games announced two limited editions for the Code: Realize series. For the Vita fans, the limited edition comes with a full-color cloth banner, eight bromide character cards, nine metal character pins, and a sleeve that can hold both ~Future Blessings~, which comes with the limited edition, and ~Guardian of Rebirth~, which is sold separately. The PlayStation 4 limited edition, Code: Realize ~Bouquet of Rainbows~, contains the exact same items except ~Future Blessings~ and ~Guardian of Rebirth~ will be available on the same disc without any additional purchase. Both limited editions for Code: Realize release on March 30th. For more information, check out the full press release below. 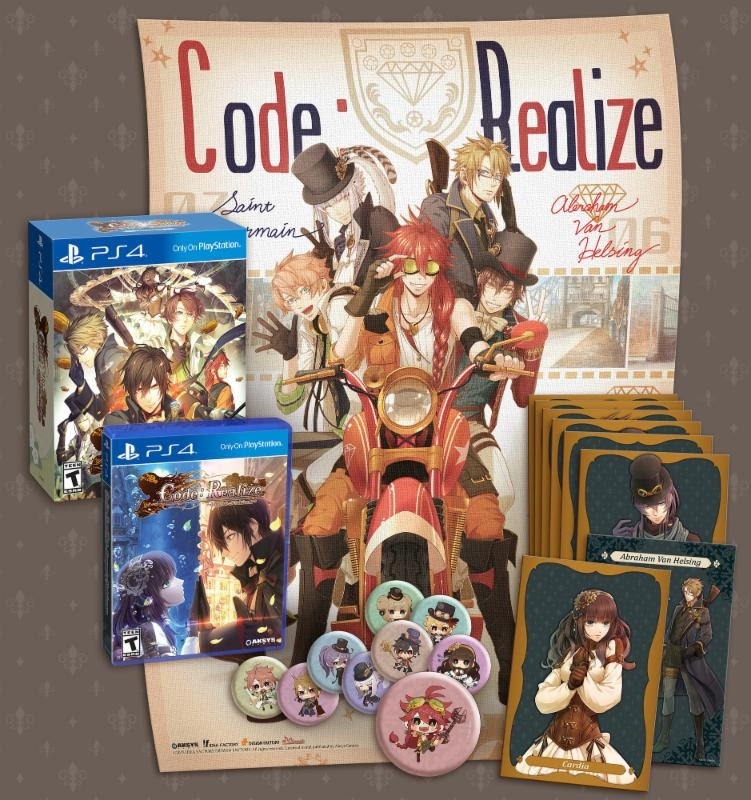 Torrance, Calif.–February 14, 2018–Aksys Games announced today that two special editions of the popular otome (or story-based adventure) series Code: Realize are coming soon to North America, featuring a variety of exclusive collectibles and content. Developed by Idea Factory, the Code: Realize games let players explore the story of Cardia and her adventures in a steampunk version of Victorian England, where she encounters a cast of intriguing gentlemen based on characters from history and literature. Both Code: Realize Limited Editions will be released on March 30 for the PlayStation®4 system and the PlayStation®Vita system. 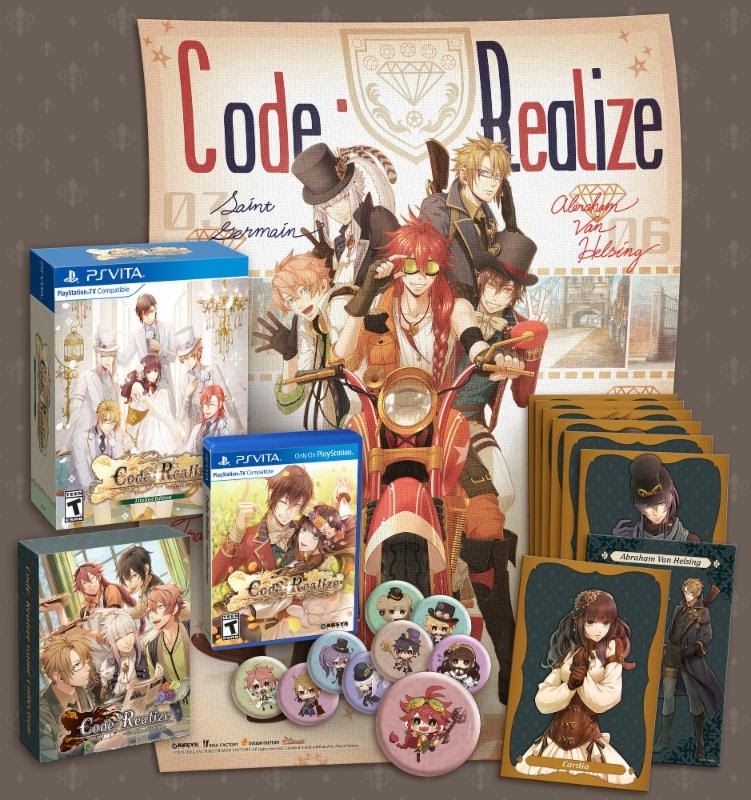 The edition for the PS Vita system includes the Code Realize: ~Future Blessings~ game, a full-color printed cloth banner featuring the gentlemen of Code: Realize, nine exclusive metal character pins, eight collectible bromide character cards, and a custom sleeve to unite your ~Future Blessings~ game with your ~Guardian of Rebirth~ game (sold separately). The PS4™ system edition entitled Code: Realize ~Bouquet of Rainbows~ includes both ~Future Blessings~ and ~Guardian of Rebirth~ on a single disc, plus the full-color banner, metal character pins and character cards. The company also unveiled plans to release three more otome titles over the next few months, including 7’scarlet, Psychedelica of the Black Butterfly, and Psychedelica of the Ashen Hawk. Each story is brimming with mystery, suspense and, of course, a little romance. The story begins with the main character, Cardia, isolated and alone in a mansion on the outskirts of a 19th century steampunk version of London. A victim of a mysterious affliction that makes her blood a virulent poison and her touch instantly lethal, Cardia is shunned as a monster.Through a number of events both grand and seemingly insignificant, Cardia is pursued by the Royal Guard, kidnapped by the gentleman thief Arsène Lupin, and joined by a myriad of other handsome figures out of the best of western literature. With her new-found friends (and suitors) Cardia ventures out in the world to unravel the mysteries surrounding her very existence.